Potential tropical cyclone 14E of the Eastern Pacific Ocean hurricane season appeared to be coming together off the southwestern coast of Mexico. 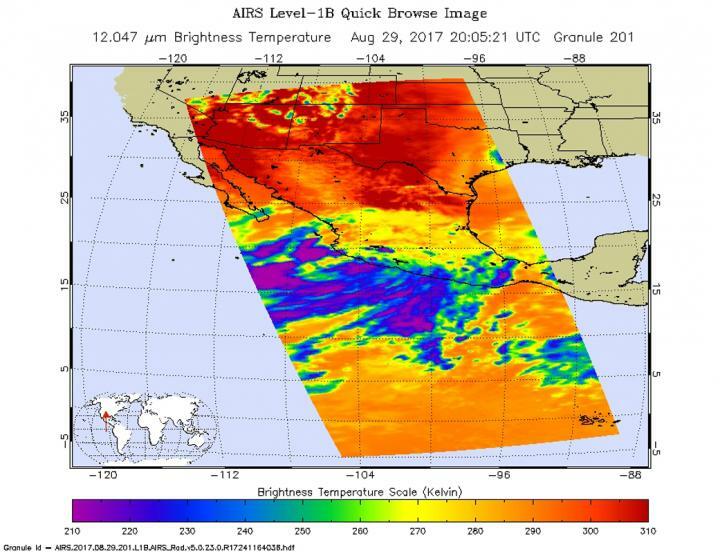 NASA's Aqua satellite captured temperature data on the storm that is producing torrential rains over southwestern Mexico. Because of the large system's proximity to land, it has spawned warnings and watches. A Hurricane Watch is in effect from Puerto Cortes to Los Barriles, Mexico. A Tropical Storm Warning is in effect for Todos Santos to Los Barriles, and a Tropical Storm Watch is in effect from north of Los Barriles to San Evaristo, Mexico. The Atmospheric Infrared Sounder or AIRS instrument that flies aboard NASA's Aqua satellite analyzed Potential Tropical Cyclone 14E in infrared light on Aug. 29 at 4:05 p.m. EDT (2005 UTC). This large system's most powerful thunderstorms were west and south of the center of circulation. Some of the coldest cloud top temperatures exceeded minus 81 degrees Fahrenheit (minus 63 degrees Celsius). Storms with temperatures that cold are high in the troposphere and NASA research has shown they have the ability to generate heavy rain. Maximum sustained winds are near 35 mph (55 kph) with higher gusts. The system is expected to strengthen to a tropical storm by tonight, and it could become a hurricane by late Thursday or early Friday. NHC said "The disturbance continues to show signs of organization, and only a small increase in the definition of the circulation would lead to the formation of a tropical cyclone. The formation chance through 48 hours is high, near 100 percent." For updated forecasts, visit the NHC website: http://www.nhc.noaa.gov.